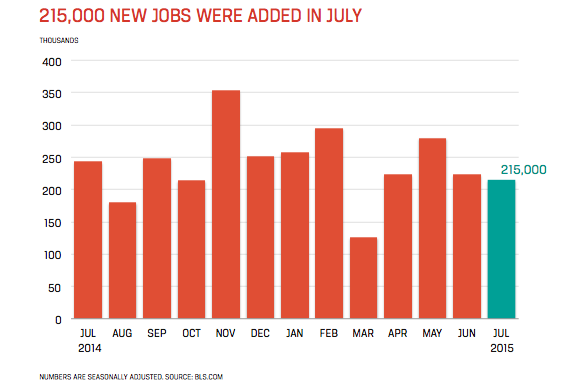 July was another good month for accounting and finance job seekers. Macroeconomic trends and continued strong demand for skilled professionals are resulting in plenty of vacancies for job candidates. According to the latest government data, the U.S. economy created 215,000 new jobs in July, including sectors such as professional services and finance. The U.S. Bureau of Labor Statistics (BLS) also revised jobs data for May and June to add 14,000 more jobs created than what was previously reported. The unemployment rate was unchanged at 5.3 percent, in line with Wall Street’s projections. Last month’s job gains occurred in retail trade, health care, professional and technical services, and financial activities, according to BLS. In June, the financial industry contributed 20,000 new jobs to the U.S. economy. There is growing speculation that July’s job gains may result in higher interest rates—as potentially enacted by the Federal Reserve this coming September. Such a hike would be the first since 2006—and the jobs report in August will likely be a key factor in the Fed’s closely-watched decision. Overall payroll growth has slowed in 2015, and many economists—and households—remain concerned about the lack of wage growth for U.S. workers. But the accounting and finance professions seem insulated from certain macro trends. The fields continue to provide plenty of career opportunities for qualified candidates. Between 2012 to 2022, accounting and auditing are projected to create over 200,000 jobs in the U.S., representing a 13.1 percent growth in the profession, according to BLS. Wages are also increasing as accounting and finance firms/departments compete for a limited pool of skilled workers. BLS’s August jobs report will be a key economic indicator, and perhaps receive more media coverage as part of this year’s national election cycle.